WinHTTrack is an offline browser utility that downloads a website from the Internet to a local directory. The program builds all linked files and directories, getting HTML, images, and other files from the server and saving them to your computer. WinHTTrack can also update an existing mirrored site, and resume interrupted downloads. Alternatively, X-WinHTTrack is a portable package for standard WinHTTrack. Writes settings to: Project files. A few non-critical settings such as language, window attributes and recent file list are written to the Windows registry. Optional: libtest, src, and src_win can be removed to save 3.40 MB. Engine fixes (keep-alive, redirects, new hashtables, unit tests). WinHTTrack Website Copier is not portable, it has never been and it will never be- it creates a new Windows shell item anytime it starts. Better use the installer version because a decent uninstaller will delete the registry entries. WebSiteZip Packer compiles HTML files into a single file (including all graphics, sounds, linked pages, etc.) with an integrated HTML browser. Ideal for e-books, product catalogs, site demos, manuals, and searchable information distribution. Sites can be packed into a single EXE or viewed with the included, standalone viewer WSZView.exe for the .WSZ format. Also works as a standard HTML viewer. Stealth: ? Yes. Both packer and viewer both operates as stealth applications. However, compiled EXE files extract to and operate from the temp folder and may remain there till you clean them. i just discovered this app from user "Observer". great little app., now if i can just find where the .exe is saved to. CHReader collects a group of related web files along with images, resources, etc. to a single compressed archive up to 4GB. The program then acts as a dedicated local web server and lets you browse the archive locally using your preferred web browser without needing to decompress. This way you can retrieve very large sites with web spiders and keep them in a compact form that can be readily viewed or referenced..
How to extract: Download the ZIP package and extract to a folder of your choice. Launch CHReader.exe. Note that sourceforge page states that CHReader is now discontinued. Thanks for the notes. Updated official entry. Fact200 is an Internet research tool that helps you find, browse and store information returned from search engines and various news sources. It is capable of prefetching result links and generating thumbnail previews so that you can view them quickly in tiled or slideshow mode. 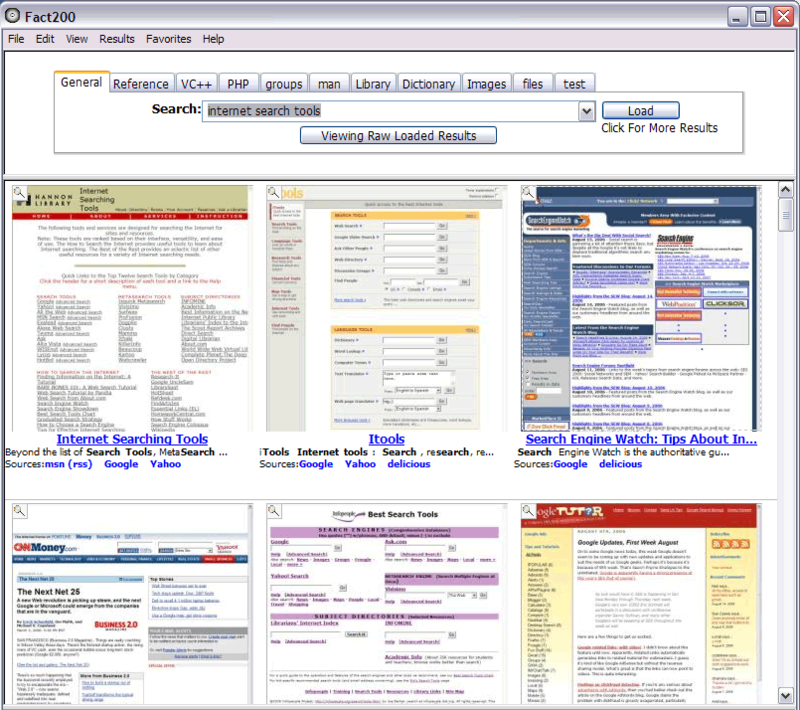 You can also store interesting web pages into a library where they are indexed and searchable. NOTE: Main site offline -- linking to archive.org. Adding feed by right-clicking on tab now saves. I installed it jsut as the instructions state, I also added a file called 'prefs.ini' just like the instructions state HOWEVER, the program doesn't write ANYTHING to the prefs.ini Instead, it still writes to the appdata\roaming folder on the C: drive. Thanks @bitcoin -- confirmed. Updated with archive.org links.